When we look at wearable computers—smart glasses like Google Glass or smart watches like our quad band GPS Watch—we tend to think of tiny mobile computers that are somehow attached to our bodies or clothing. The core attributes, we believe, are miniaturization and convenience. A smart watch, for example, saves you the trouble of pulling a phone out of your pocket to check your notifications. But these qualities are irrelevant in the face of the real revolution. Wearable computers will find out what you want to know, then make you know it. A company called Refresh this week introduced a new Google Glass “glassware” app called Refresh. The app is similar to a Refresh tool for the iPhone that’s known as Refresh App. Both are designed to present “dossiers”—summaries of information—about people. One of its neat tricks is to check your calendar, see who you’re meeting with, then brief you on selected facts about those people. Because the Google Glass version of Refresh rests on your face, it does a simple version of what all wearables will do in the future—it finds out what you want to know, then it makes sure you know it. For example, wearable devices could help you learn more about people you meet—filling you in about whether you’ve met them before or if you share common acquaintances, interests or histories. It’s a small thing. But imagine a future where anything you might want to know simply appears to you without any action or effort on your part. You could be eating in a restaurant, and Google Glass could, for example, tell you that it’s the spot where your father proposed to your mother. Or that your friend will be late because of traffic, the salmon got bad reviews online, your parking meter will expire in 20 minutes, or the bathroom is through the bar and up the stairs to the right. Imagine that such knowledge could simply appear into your field of vision at the exact moment when you want to know it. That’s where wearable computing is going. That’s why the wearable revolution is mostly an artificial intelligence revolution. What’s really interesting about wearable computing is the work that back-end servers do to figure out what you want to know and then acquire that knowledge. The delivering-it-to-your-brain part is relatively trivial. A LED projector is best used in an enclosed space, where walls or thick curtains prevent light from streaming in. This is allows the LED beamer to produce clear, crisp pictures that are easily discernable even from a long distance away. But what if you have to use a LED projector in an environment where dim lights are turned on for participants to see in the dark? Worse still, what if you have to use a projector in a fully lit environment like an open-air stadium or an auditorium with the lights on full blast? If you ever have a choice between using your LED video projector in an indoor and outdoor environment, choose the indoor environment. Sunlight is insanely powerful and is much more effective at obscuring the light from a LED projector than some measly light bulbs. If you are in an outdoor venue, then make sure the projector and the surface are at least inside the shade. Fighting direct sunlight with a projector will be futile. If the venue must be lit, then do your very best to block the lights from hitting the screen and the projector’s lens. You can do this by redirecting the lights away from the screen’s surface or by covering the top and sides of the screen so that it has a little alcove of darkness for the projected images to be a little clearer. 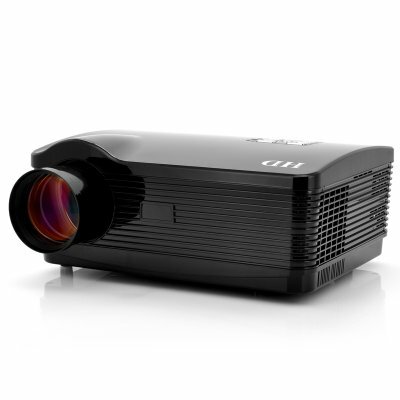 If all you have is a relatively low-power portable projector with you, then you will need to move it to within a few feet of the screen itself. Doing so will focus the beams of the LED projector so that it will produce a much clearer image for the audience. The downside is, of course, that the image won’t be as large as you want it to be. Small text and images will be made even smaller to the point of being illegible, so keep this in mind when working with larger audiences. Every digital projector has a button or configuration somewhere that will allow you to ramp up the brightness of its lamp to the max, allowing it to work better in lit environments. This will, however, significantly ramp up the heat generated by the projector. Make sure that it is an open environment and that its exhaust ports are unblocked, and keep it running in short stretches at a time to give the LED projector some time to cool off. Some bulkier and more expensive LED computer projector models have really, really bright lamps that can create better images even in direct sunlight. These work extremely well with high-gain screens focus the light that hits it and is much better at reflecting it than most other screens. The downsides here are that both options are quite expensive while the clarifying effect of high-gain screens is only visible when viewed head-on.